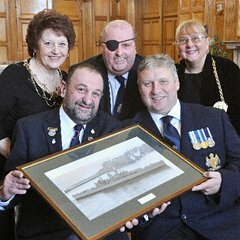 The Mayoress Stella Matthewson (left) and the Mayor, Councillor Fay Cunningham, (far right) are pictured with former crew members Florrie Ford, Blood Reidy and George Patterson, with a picture of HMS Euryalus. A call has gone out to seamen who served on board South Tyneside's adopted ship, HMS Euryalus, for a special reunion later this year to mark the centenary of the Gallipoli landings. A reunion is being held in Bury to mark the centenary of the Gallipoli campaign where HMS Euryalus played a key role by taking the 1st Battalion of the Lancashire Fusiliers ashore. It is documented that members of the Lancashire Fusiliers "won six Victoria Crosses before breakfast." HMS Euryalus also provided naval gunfire in support of allied troops. The Lancashire Fusiliers are organising the reunion, which will span three days, and will be at held in Bury from 24 - 26 April. As part of the event, the six VCs won by the Lancashire Fusiliers will be on display together for the first time. Ex Petty Officer Florrie Ford of South Shields said: "There will be more than 50 of us who are former members of the crew of HMS Euryalus who are already planning to go to the reunion so there is a lot of momentum for this occasion. "But we know a lot of former crew members married and settled in South Tyneside so would be keen to hear from them - and their children - if they would like to come along." The Mayor of South Tyneside Councillor Fay Cunningham said: "When these former officers came to see me it really brought it home to me just what a special place HMS Euryalus holds in the hearts of people in the Borough. I feel it is only right that former crew members are honoured in this reunion." Councillor Ed Malcolm, Chairman of South Tyneside's Armed Forces Forum, said: "I hope more people with a link to HMS Euryalus come forward as it would be nice to involve former crew in our Gallipoli commemorations later this year." HMS Euryalus became the Borough's adopted ship and in 1981 was awarded the Freedom of the Borough. This means that the ship's company can march with fixed bayonets. More than 550,000 Allied troops participated on land and in ships off the coast in the Gallipoli Campaign from Britain, the Indian sub-continent, Australia, New Zealand, Canada other Commonwealth countries and France. In total their casualties, including those killed, sustaining serious injuries, falling sick or missing, numbered more than 200,000. Any former sailors who still live in South Tyneside and would like to attend the reunion are asked to contact Florrie Ford on (0191) 423 4186 or 07847391712.